For a brief time I worked as a case manager in a program for vulnerable immigrants and victims of human trafficking. It was such a rewarding experience to see people heal and blossom when given care and help. The funding ran out and the program shut down. But I'll never forget the experience. One of the clients enrolled in the program loved noodles. We bonded over our mutual love of noodle dishes, sharing recipes and proudly proclaiming that we could make better sesame noodles than the gourmet market across the street from the program office. There are those who must have steak and potatoes and those who must have Asian noodles. 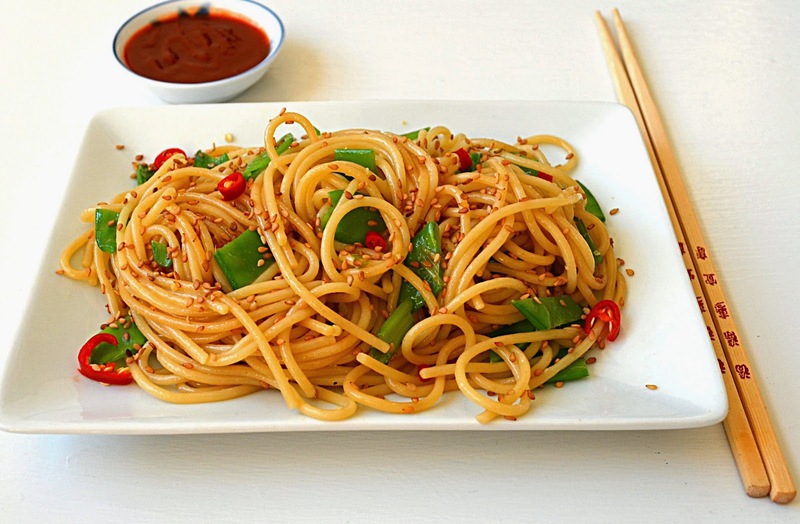 This recipe is for all noodle lovers. If you're tired from a long day, craving your fix, comfort is found here. It's ready in under 30 minutes. 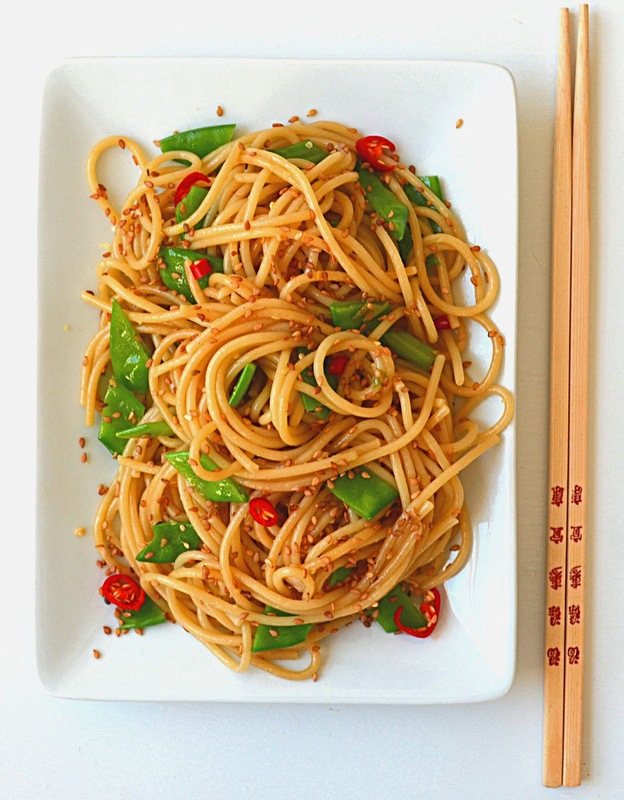 The sauce for this dish is enlivened with spicy ginger and scallions. Sesame oil and sesame seeds make it so warm and inviting. The snow peas remain bright green and crisp against the tangles of pasta. Lime brings its tangy freshness. The noodles are good cold, hot or at room temperature. You can toss in some sauteed chicken, tofu, bean sprouts or mushrooms if you'd like. Quickly defrosted frozen peas add a bright green, sweet pop. A fried egg on top is a good idea too. 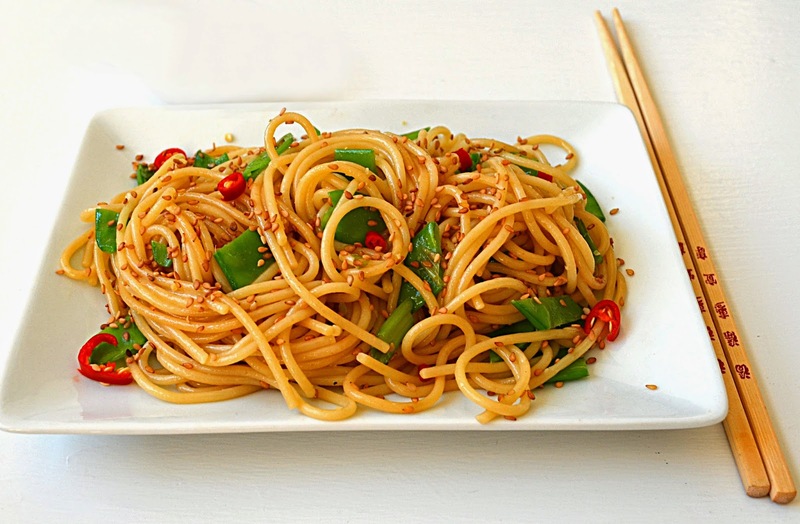 Wel-Pac Chinese Noodles ( also used for making chow mein) are a good choice for this recipe too. I find them in my regular market. Soba noodles would work too. Try not to overcook the noodles. They should remain slightly chewy and not mushy. Fresh lo mein noodles can be found at most Asian grocery stores. 2 tablespoons of soy sauce. I use shoyu. Toast the sesame seeds in a small dry fry pan, on medium heat, until golden and fragrant, being careful not to burn them. Put the seeds into a large bowl after toasting. Juice all of the lime into the bowl with the sesame seeds. Grate the ginger into the bowl and add the diced scallions, soy sauce, toasted sesame oil, neutral oil and a pinch or two of salt. Cook the spaghetti according to the package instructions. When it's almost done cooking, toss in the snow peas and drain. Put the spaghetti and snow peas into the large bowl with all the other ingredients and toss to combine. Taste. Adjust the salt and add more sesame oil if needed. Serve with any of the above suggestions. Oh! This looks so amazingly delish! 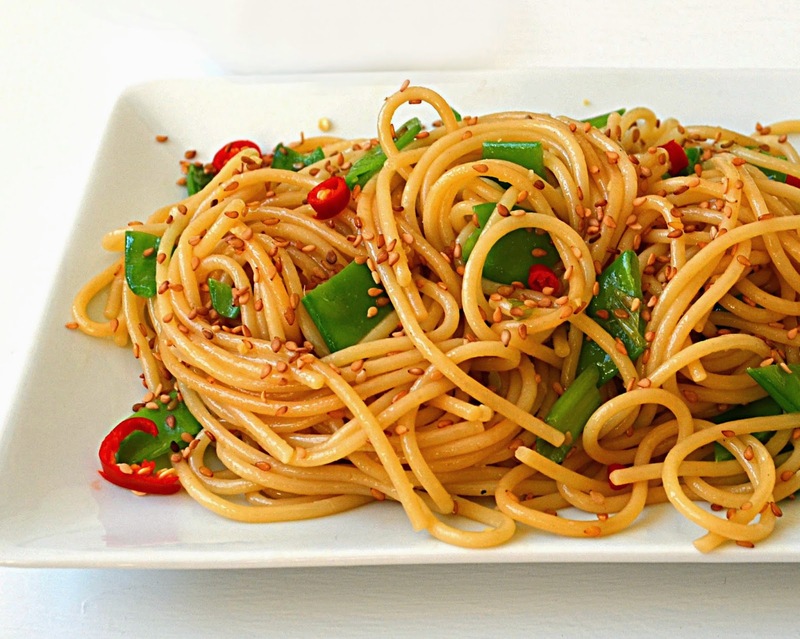 I love the taste of sesame and can't wait to try these noodles! Hi Andrea, Thanks so much! I hope you try it. Happy Cooking!